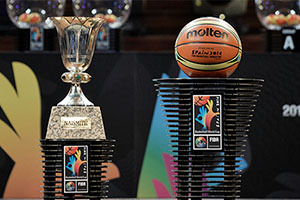 So here we are, almost at the final of the 2014 FIBA Basketball World Cup and the only thing that is left to do is present the trophy and the Gold Medals to Team USA. Yes, there is still a game to be played but it is surely in the bag isn’t it? It would be the biggest upset in basketball, and one of the biggest shocks in sport, if Serbia were to win the final on Sunday. Just take a look at the odds on offer for the final. Bet365 are providing you with odds of 1.033 for a Team USA win while the odds on a Serbia victory stand at 17.00. The odds available from Bwin are slightly more balanced but even at that, it is 1.03 for Team USA to win and Serbia are at odds of 11.00. This is a final that everyone expects USA to win but of course, it is not the final that everyone was expecting. This goes to show that things don’t always go to plan in sport. USA have kept up their side of the bargain, winning every game by at least 20 points so far and proving themselves to be on a different level compared to their opponents so far. The thing is though; this was supposed to be a USA v Spain final, the clash of the titans, duelling in arena where home advantage may have tipped Spain to a victory. This hasn’t happened, France caused a major upset in the quarter-finals to ditch Spain from their destiny and then Serbia put France in their place in the semi-finals. This brings us to the situation where Serbia know that they have at least a Silver Medal for their efforts and who knows what they will eventually take home after the dust settles on Sunday. Can Teodosic turn the tide? The main for Serbia is likely to be Milos Teodosic who grabbed 24 points in the semi-final win over France. He currently plays for CSKA Moscow but he is a player who can more than hold his own in the NBA if he wanted to. However, Teodosic is contracted to the Moscow side for another three years and he shows no sign or desire to head to America to play in the big league. Given that he notched 23 points in the quarter final, he is showcasing a run of form, which is also one of the most important elements in a major tournament. He is the man the USA will want to stop if they are looking to make the final as comfortable as many people believe it will be. You can expect Stephen Curry and Kyrie Irving to be at least slightly distracted from their desire to score by the presence of Teodosic. Serbia have had a strong offensive performance in this tournament, it is just the fact that it pales alongside what the USA is offering. This is why so many people can’t see beyond Team USA. Even if Serbia do find their A-game and score, you expect the USA to be able to outscore them, and if the game opens up, there could be a demolition job on the cards in Madrid. 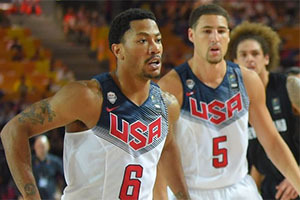 Who will step up from Team USA to make a big difference? One of the things about the American team is that different players have stepped up at different times. In the semi-final match, Klay Thompson delivered five three pointers and 16 points overall. This was on the back of a few questionable displayes. Similarly, Derrick Rose has shown glimpses of his talent but he has been off the boil in the most recent games for the USA. As long as someone steps up, the American team will be okay but if everyone expects their teammates to do it, rather than taking charge for themselves, it could be a lot more difficult for USA than many people expect. They may lack the star names that they could have brought but this is still a very strong squad and the fact that it acts like a team is definitely something that is the favour of the American side. Click the button to see our free tip and associated trends between USA and Serbia. Sports betting tips for other sports than basketball, such as football, NFL and UFC, can be found on SportsBettingTips.org. Bwin is running a number of handicap odds if you fancy making this a tighter event. With USA at -15.5, you get odds of 1.45 for a Team USA win while Serbia are at 2.65 with a +15.5 boost. Team USA are listed at 1.65 for a -18.5 handicap while Serbia are available at 2.15 with a +18.5 boost. America are listed at 1.91 with a -21.5 deficit and Serbia are at 1.83 with a +21.5 start. It is not until we see USA with a -24.5 listing that the odds tips in favour of Serbia with USA listed at 2.30 and Serbia at 1.57 with a +24.5 start. Bet365 think that with a 20.5 handicap, all things are equal so you will receive odds of 1.95 for USA -20.5 and you will receive odds of 1.95 for Serbia at +20.95. The same site also provides odds of 1.95 for the total points scored in the game being over/under 176.5. Bwin, as usual, give a wider range of bets for the totals market, including 1.87 for an over/under 175.5 points but you get odds of 2.15 for there being over 178.5 points while under 178.5 carries odds of 1.65. After this, odds of Serbia winning stand at 101.00 or over. Before the match starts, this is a huge mismatch but once the action starts, if Team USA aren’t fully focused, we could be in for quite a game. Either way, Sunday’s game will see the crowning of the 2014 FIBA World Champions.